It was a rainy Sunday morning in mid-April, the kind that makes one wish to be at home by the stove enjoying a cup of hot coffee. However, notwithstanding the grim and chilly weather, we were instead on the Noto Peninsula in Ishikawa Prefecture witnessing a flock of over 20 people vigorously using hoes to repair the ridges of rice paddy terraces. If you are an urbanite, you might be amazed by such a farming scene set in the drizzly early spring on steep slopes overlooking the sea. Perhaps even more surprising would be the fact that these people were not local farmers. They were regular urban folk who live over 100 km away in Kanazawa City, the prefecture’s capital, and only experience farming practices several times a year for two-hour periods. The willingness of these city-dwellers to be working on such a day stems from their desire to help preserve a historical agricultural landscape that not only has a role in the area’s culture but is now intertwined with the surrounding ecosystem and its biodiversity. 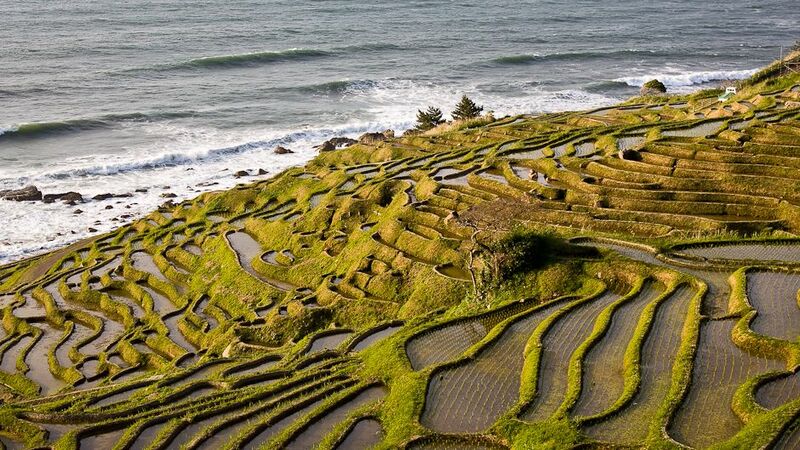 These terraces, called Shiroyone Senmaida, which consist of over 1,000 small pieces of paddy perched on the sharp hills along the coast, were first established in the 17th century. After almost half of the tiers were destroyed by flood in the second half of the 19th century, the stair-like terraces were restored by the people of Shiroyone Community, which is part of nearby Wajima City. However, nowadays that group of local farmers keeps shrinking — due to a continual drop in the agricultural workforce and the aging of the local population — and they could only cultivate a small part of the terraces. So, as part of an initiative to assist in maintaining the terraces, conservationist volunteers and urban “owners” (who do not actually own the land but are allotted a slot in a stewardship system) are now helping to cultivate the majority of these terraces, which are called tanada in Japanese. Urbanites experience traditional farming by using hoes to repair the mud dykes on Shiroyone Senmaida, Ishikawa Prefecture, Japan. Photo by Bixia Chen. These city-dwellers often participate in the farming experience as two- or three-generation family units. On our recent visit to the terraces, one couple commented that repairing the mud ridge looked like a simple task, however, it was in fact very difficult to do the job as well as an experienced farmer would. The woman said that the family decided to apply for a spot in the initiative this year after hearing about Shiroyone Senmaida through television reports. During breaks in the farm work, their 2-year-old daughter played joyfully around the fields with the children of other participants. Spending time in such a spot is certainly of educational value for children from urban areas. The Noto Peninsula’s rich history and culture dates back over 2,100 years and, according to archeological surveys, the roots of today’s agricultural system can be traced to the Nara Era over 1,300 years ago. As discussed previously on Our World 2.0, the peninsula was recognized in 2011 as one of the world’s Globally Important Agricultural Heritage Systems (GIAHS). The GIAHS initiative by the Food and Agriculture Organization of the United Nations spotlights systems that “are rich in agricultural biodiversity and associated wildlife, and are important resources of indigenous knowledge and culture” that have resulted “in the sustained provision of multiple goods and services, food and livelihood security for millions of poor and small farmers”. During breaks in the farm work, the children of terrace paddy “owners” joyfully played around the fields. Photo by Bixia Chen. Indeed, Noto is characterized by a mosaic of managed socio-ecological production landscapes, referred to as satoyama, and marine-coastal ecosystems comprising seashore, rocky shore, tidal flats and seaweed/eelgrass beds, known as satoumi. However, a trend of economic decline brought by rural-to-urban migration that leaves the countryside reliant on an aging population not only affects the community of Shiroyone but a wide range of Japan’s rural areas. Mountainous regions, in particular, are subject to farmland abandonment. As terraced rice fields are found in mountainous areas, it has been estimated that around 40 percent of paddy terraces in Japan have been abandoned. The beginning of this loss can be traced back to the end of the 1960s when rice production exceeded demand, leading the government to request that farmers convert parts of their paddy fields to other crops. Terraced paddy fields were among the first paddy fields to be abandoned due to low productivity and the difficulty of using machines there. Fast forward to the near present. With the recognition of the multifunctional role of terraced paddy fields, in particular for their part in providing ecological and cultural services, conservation activities began emerging nationwide in the 1990s. Following a summit on the topic attended by over 1,200 researchers, officials and citizens, a “Tanada Renaissance” was launched and a nonprofit support network was established. As was the case in several regions of Japan, Shiroyone Senmaida’s conservation activities were launched by volunteers from a wide range of organizations and cooperatives. The “Tanada Owner System” — which is a rather unique voluntary civil farming initiative recognized for fostering valuable long-term rural–urban relations — was instituted here in 2007, with about half of the urbanite participants coming from Kanazawa and half from other cities, such as Tokyo and Nagoya. Shiroyone Senmaida consists of 1,004 parcels of terraced paddy fields covering 40,051 square metres. As of August 2011, there were only three farm households, which collectively cultivated a total of 396 parcels of Shiroyone Senmaida’s paddy fields. Each parcel of land is extremely small, averaging just 18-20 square metres. The average age of local farmers is 73. Apart from those parcels cultivated by local farmers, Wajima City employees, Japan Agricultural Cooperative Ōzora, the ”Owner System” participants, and a sake brewing company are farming 130, 121, 277 and 7 parcels, respectively. (The UNU Institute of Advanced Studies Operating Unit Ishikawa/Kanazawa has been supporting the local conservation activity as one of the 277 “owners”.) Of the remaining parcels, 37 were abandoned and 36 were transformed into upland fields to grow crops other than rice. Apart from providing labour support to counterbalance depopulation and the aging of remaining farmers, the “Owner System” also received a fair amount of media coverage, which importantly generated interest in farming among urban people and raised consciousness regarding the decline of rural areas. This new awareness is a topic of some importance in a country that has had food security and a transition to low carbon lifestyles in its national goals for some time now. However, in regards to contributing to any overall target of sustaining rural agriculture and the rural economy, “owners’” support of rice planting is far from enough. Therefore, a branding effort was launched with the aim of making terrace rice cultivation profitable enough to encourage the local farmers to continue and even restore abandoned terraces. After the designation of Noto as a GIAHS site, the local community has come to recognize that it is crucial to conserve not only their rural landscape but its rich biodiversity for future generations. Thus, it was decided that a brand called “Noto Tanada Rice” (literally, Noto terrace rice), marketed by four Japan Agricultural Cooperatives (JA) located in Okunoto, at the northern tip of Noto Peninsula, would be farmed with reduced chemical use. The total area of terraced paddy fields in Ishikawa Prefecture is roughly about 2,500 ha, of which 80 percent is located in Noto Peninsula. In 2012, the first year of its launch, Noto Tanada Rice included only around 28 ha with 15 communities involved. According to one of the participating cooperatives, JA Ōzora, the brand’s rice plantation area will be extended to 60 ha in 2013 and reach around 100 ha in 2014. More importantly, starting in 2013, chemical inputs have been reduced to 50 percent of that used in conventional farming practice. Noto Tanada Rice was priced at ¥640 per kg, around 42 percent higher than koshihikari rice (a particularly esteemed cultivar and one of the most widely grown in Japan) farmed in Ishikawa Prefecture, which is priced on average at ¥450 per kg. Aside from its economic importance, Noto Tanada Rice branding will also contribute to the conservation of terraced paddy fields in the future. A conservation foundation will be established to subsidize weeding at the ridges and cleaning the water courses of the paddies. And this biodiversity-friendly approach is spreading. A parallel initiative of branding for rice grown on paddy fields in the whole Noto area was announced by a Noto rice promotion association composed of seven Noto cooperatives and JA Zenno Ishikawa on 1 December 2012. The target is to promote a 30 percent reduction in chemical input by 2014 on all koshihikari cultivation, which accounts for 60 percent of the total paddy fields in Noto, around 12,000 ha. Some may wonder whether such fast conversion from conventional to sustainable farming over such a wide area is feasible. However, the central figure of these two branding initiatives, Shigenobu Fujita, former farming division director of JA Ozora, expressed his confidence that many farmers are determined to produce high quality agricultural products and feel proud of their agricultural heritage. 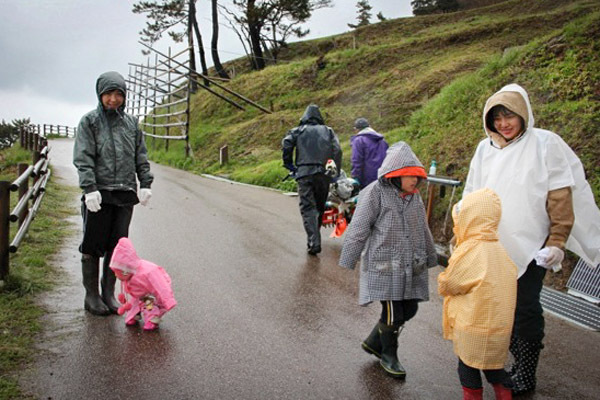 If flocks of city-dwellers will trek to steep hillside paddies to work in the damp spring weather, then nothing seems impossible. The terraced paddy field conservation activities in Noto Peninsula will be discussed and shared among other Asian countries (e.g., China and Korea) at an international workshop to be held by UNU-IAS OUIK on 28 May 2013. For more details on the “Experiences and Lessons from Asian GIAHS Pilot Sites” workshop, please see the UNU-IAS website. 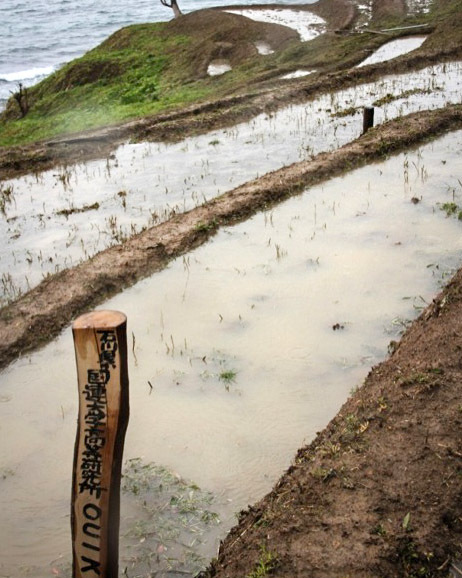 Urbanites Help Sustain Japan’s Historic Rice Paddy Terraces by Akira Nagata is licensed under a Creative Commons Attribution-ShareAlike 3.0 Unported License. Mr. Akira Nagata is a Senior Programme Coordinator at the UNU Institute for Sustainability and Peace. He is coordinating collaborative activities implemented by UNU-ISP and the Ministry of Agriculture, Forestry and Fisheries of Japan such as On-the-Job Capacity Building for Sustainable Agriculture in Developing Countries and Globally Important Agricultural Heritage Systems (GIAHS). He graduated from Hokkaido University, where he majored in Crop Science. Dr. Bixia Chen was born in China and received her Ph.D. in Forest Policy and Forest Economics from Kagoshima University, Japan. She has published extensively in the fields relevant to traditional rural landscapes and traditional uses of natural resources. She is a Research Associate at the UNU Institute of Advanced Studies, Operating Unit Ishikawa/Kanazawa and conducting research related to GIAHS with a focus on the dynamic conservation of traditional agriculture, forestry and fisheries of Noto’s Satoyama and Satoumi Landscapes.